Upper Deck has once again given collectors a bit of a change when it comes to one of their established brands. Trilogy has come out and it has released in a new form. The pack and box configuration now resembles one of Upper Deck's other products, Artifacts. The good news is that Trilogy is not as pricey as it was. I wonder if the change is a good one for this brand. I'm eager to crack into a box and see for myself. Trilogy has alway been a higher-end sort of product. It's not top of the line like Ultimate Collection or The Cup, but it always sat in a price range that prohibited the average collector from really buying a lot of it. That being said, the base cards truly reflect the premium quality and price of Trilogy. The base cards have a strong design with great texture and foil accents. While the cards don't have the thickness of their more expensive brothers in Ultimate Collection or The Cup, these cards are not flimsy and do not feel cheap. The Trilogy base cards look great and have a design that really pops this year. It's unfortunate that collectors nowadays really disregard base cards as a whole, but I still enjoy seeing base cards that are well done, and these certainly are. The back of the base card has a muted look as compared to the front. It's a nice design choice, especially given that the back of the card is pretty simple in terms of its content. There's no write up for players and only five seasons worth of stats are included. In all, it's a good looking back with little content... which is very typical for higher-end cards. Similar to last year, Trilogy rookies come in three rarity tiers. There's the standard version, uncommon version, and rare. The standard rookie cards are numbered to 999 and feature no memorabilia or autographs. These cards stand out as they are completely enhanced with foil throughout the surface of the card. The uncommon and rare rookie cards in the set come in lower print runs and feature an autograph on them. Well, all except for Jack Eichel, who has an exclusive autograph deal with Leaf. Both uncommon and rare rookie cards feature a design that is a different from the standard rookie card, but all retain the all-foil look. Interesting to note, as the rarity increases the player photo gets closer up. So rare cards will have some pretty up-close shots of the featured player. 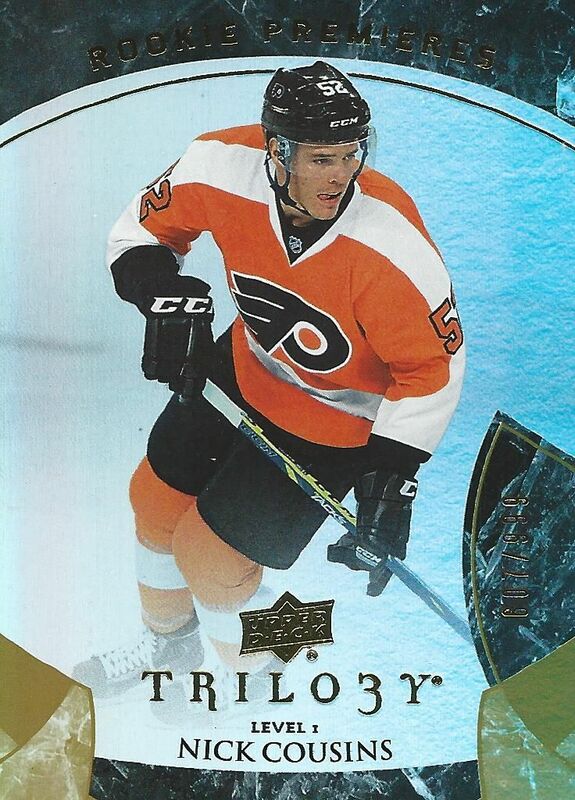 With Trilogy having three base rookies in the set, it can be confusing to collectors which rookie out of the three is the 'true' rookie from the set. Don't ask me, though, I couldn't tell ya which one was! Though the configuration of Trilogy is different, many of the same insert types from the brand have returned. Collectors can find autographed cards, jersey and patches, as well as the signature mini puck cards that have been popular in years past. The front of the box does not state a guaranteed number of hits... only that there are three levels of rookies to look for inside. Trilogy parallel cards come with serial numbering that boggles the mind. 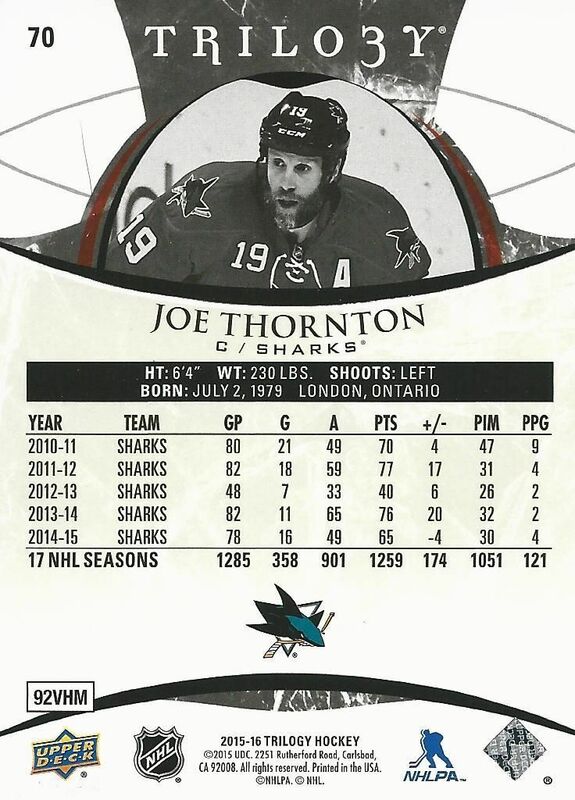 Rather than having standard print runs to numbers that are familiar to collectors like 99, 499, etc... Trilogy has chosen to print cards to various career numbers of the players. 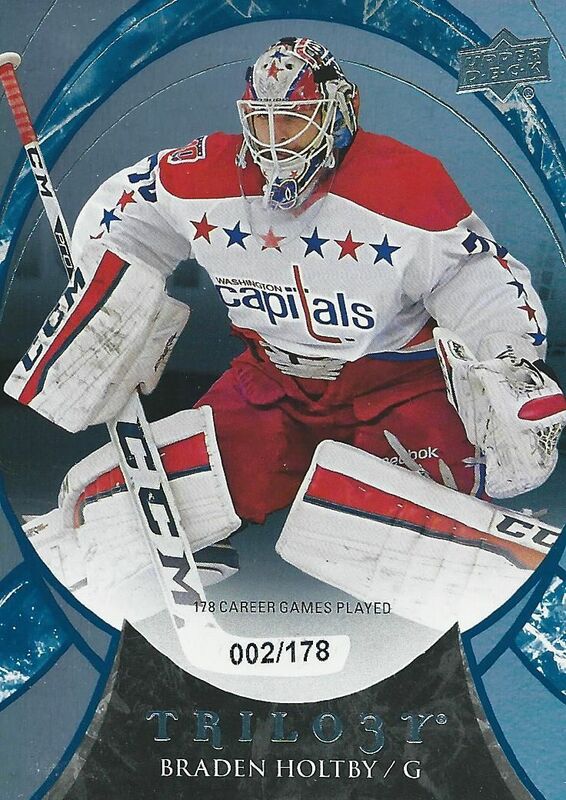 The Holtby card above has a print run to his career games played of 178. I find that number to be very strange as it is a number that is pretty much irrelevant right when the season begins as it would change once he played another game. Career games would make more sense for retired players, not for current ones. That's just my opinion though. Besides standard base parallels, Trilogy offers up jersey and patch parallel base cards as well. Again, these cards are numbered to some odd choice. 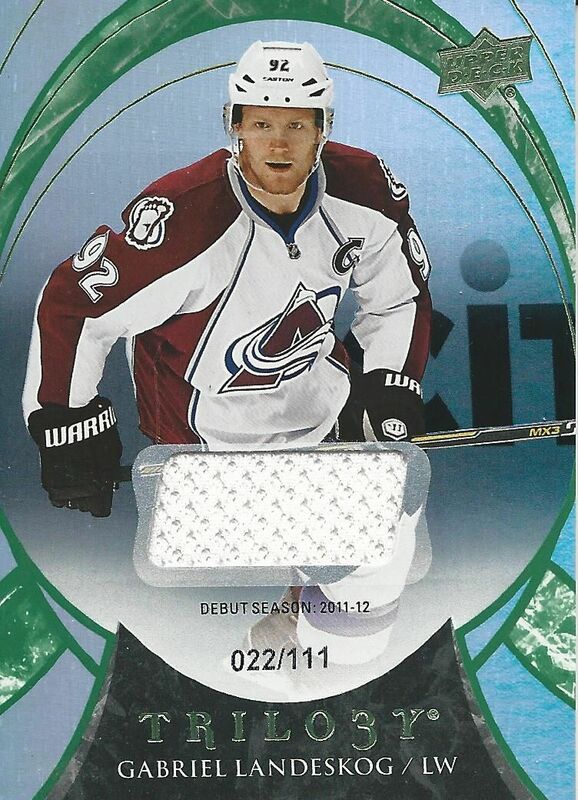 The Landeskog above is numbered to his debut NHL season of 2011-12... so it is serial numbered to 111? Don't ask me! I have no idea. 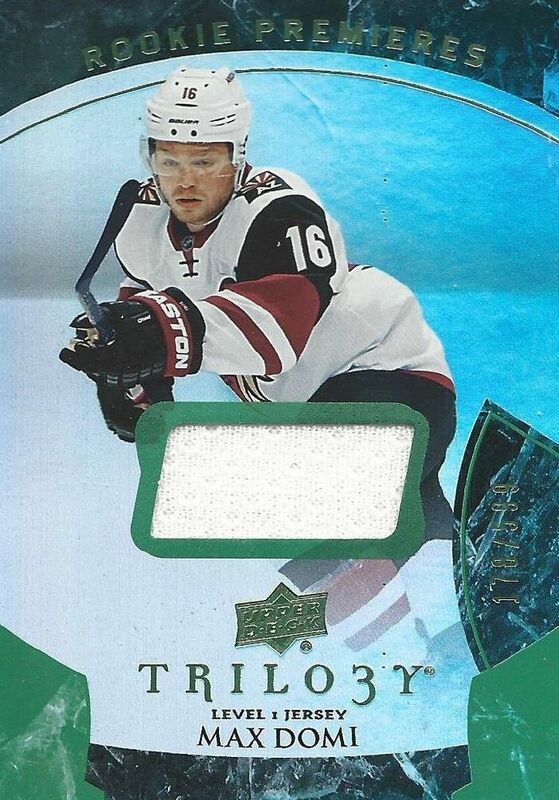 My rookie parallel card was of Max Domi. Though this card looks similar to the jersey parallel of the base set, it has a couple notable differences. One, this card is extremely thick. You would think there was a patch imbedded in this card, but there isn't. It's just a lowly jersey. Secondly, the serial numbering on the card is the regular, modern foil serial numbering. If you've noticed, other Trilogy parallels feature the old printed on numbering... which can be bad because of smudging potential. And yes, I have seen breaks where the serial numbering was smudged. Pretty much all the hits I received in my box were parallel cards of the base set as I didn't get a signature puck or Tryptichs card. So everything was pretty one-note. 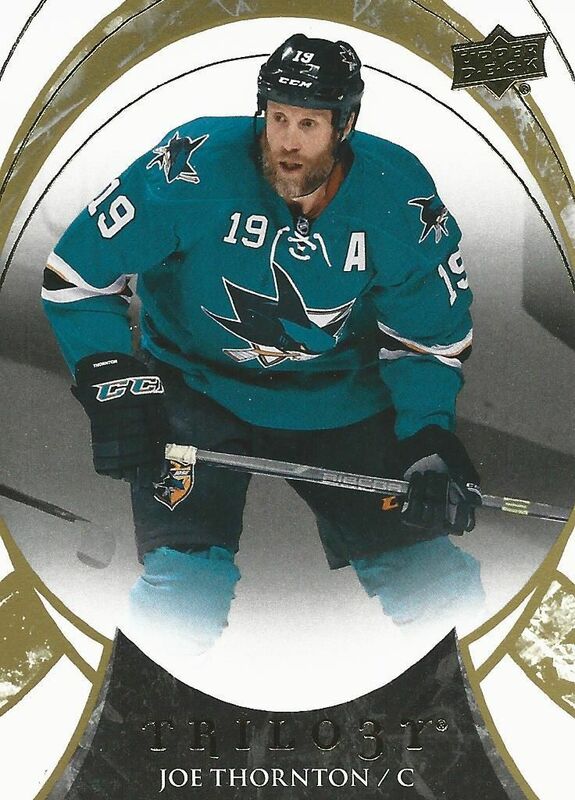 I personally think the Tryptich set this year is interesting as it features a mountain-like die-cut, but the signature puck cards seem to have taken a downgrade as they do not look as nice as they did last year. I am glad that Trilogy's price has come down a little. It is now a bit more affordable to collectors than what it once was. Because of the change, Trilogy actually feels a bit more like an Artifacts break, but without all the crazy parallels. The Trilogy base cards look great, and the cards have a premium feel to them, but overall the set seems a bit one-note. It may have been that I didn't get any inserts/hits except for parallel looking cards, but I still feel that most of the cards out of Trilogy will have a sameness to each other. Trilogy is a brand that looks great, but is truly a mid-season product. In this I mean that it will satisfy collectors now as they are hungry for releases, but in the long run Trilogy cards have not been the 'must-have' cards of the season. In fact, most of the time they are almost totally out of collectors mind by the end of the year. I'd purchase Trilogy sparingly for that reason and for its price. There are other products that are probably more worth your time. I'd just get a box or two of this and move on. Great review, and Max Domi has really been following you around lately. Love your videos and reviews, The comment was quick because I was checking to see if u uploaded any vids!!!! As usual, thanks for posting up your break and offering us a chance to win! Nice hits overall and I definitely agree with the odd choices in their numbering schemes. I remember seeing a Ben Bishop parallel on SCF which denoted his "career goals against", which I find to a "less than appropriate" relatively high parallel number. This is a really good year for hockey card with McDavid, Eichel and all the other good rookie. Nice Domi redemption and box! Sweet box and good looking product. I like the somewhat obscure numbering of some of the cards. Is a cool change to get something /178 as opposed to /199 like you typically would. Nice product by Upper Deck! Very nice Domi. Great review! I like the domi hits and the design of the base cards! Nice Domi auto! That redemption saved the box right there. Base cards are nice! That redemption card is a sick one and also love the Domi jersey. 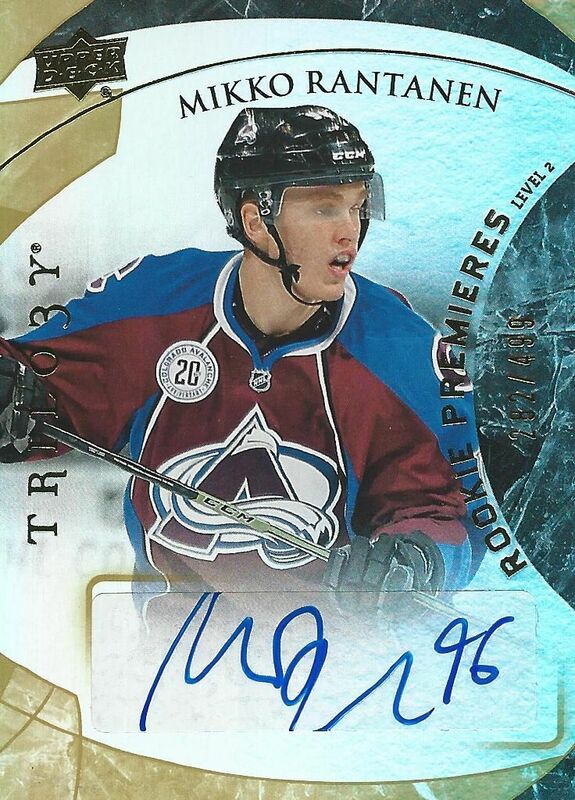 - I miss the "glass cards" from earlier years, especially since the Ice Scripts cards seem to be hard pulls this year. Thanks fr the review, nice to see the price come down a bit! Awesome review! Love the Domi cards! Awesome product, got something in every pack, and I like that the price is lower!